Welcome to the Christian Science Society of Tampa Bay! ﻿The heart of Christian Science is Love. It’s about feeling God’s goodness and love for you, me and all mankind. It’s about making this Love practical in our everyday lives, and Love meeting our every need, from healing physical ills to mending broken relationships. 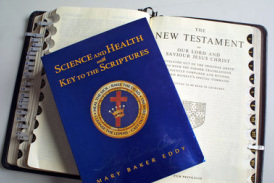 Christian Science is based on the Bible and is explained in Science and Health with Key to the Scriptures and other writings by Mary Baker Eddy. For a more in-depth treatise on the theology of Christian Science, refer to “A Self-Understanding of Christian Science” by Shirley Paulson, Head of Ecumenical Affairs at The First Church of Christ, Scientist, in Boston, Massachusetts. The term “Christian Science” was first used by Mary Baker Eddy to describe the Science of Christianity, which Jesus taught and lived. After her discovery in 1866 of the divine laws underlying Jesus’ ministry, Eddy dedicated herself to teaching, preaching and healing through a system of applying these spiritual laws. In 1875, she published her primary book on this subject, Science and Health with Key to the Scriptures. Then, in 1879, Eddy founded her church, calling it “Church of Christ, Scientist”, and her students were known as Christian Scientists. The church was designed “to commemorate the word and works of our Master, which should reinstate primitive Christianity and its lost element of healing.” (Church Manual, p.17). In 1892, the church was reorganized and named “The First Church of Christ, Scientist”. The church headquarters, also known as The Mother Church is located in Boston, Massachusetts, and there are branch churches today in over 75 countries. The Christian Science Society - Tampa Bay is one of those branches. It is not necessary to join the church to study Christian Science, and you are welcome to attend our services at any time. More information about What is Christian Science? Healing every type of human challenge through the prayerful application of the teachings of Christ Jesus is fundamental to Christian Science. Earnest study of the textbook, Science and Health with Key to the Scriptures by Mary Baker Eddy, is essential for each seeker; however those who would like support in their prayers can call upon a professional Christian Science practitioner. These individuals devote their lives to the practice of healing and are readily available to help you. Our group, the Christian Science Society - Tampa Bay, is a branch of The Mother Church (described above). We are a healing and loving church that is based on the teachings of Christ Jesus as taught in the Bible and made practical in Science and Health with Key to the Scriptures by Mary Baker Eddy. Generally, our group is informal and progressive, while still adhering to The Manual of The Mother Church. Our members are from all over the Tampa Bay area including Tampa, St Petersburg, Clearwater, Brandon and Pinellas County. More Information About Our Group. No matter what your beliefs, or where your journey has taken you, at the Christian Science Society - Tampa Bay you are accepted, respected and loved. We would love to have you join us at our Sunday morning service, and Sunday School for young people up to the age of 20, which meet at 10:30. The Wednesday evening meeting at 7:30 features short readings from the Bible and Science and Health followed by individuals sharing how they practice the teachings of Christian Science experience healings in all phases of their daily lives. Nursery care is provided for the very young children at all services. GoVerse mobile app makes it easy to find and share inspirational ideas on dozens of topics including decisions, jobs, sports, stress, relationships and purpose. Scroll through hundreds of quotes from the Bible and Mary Baker Eddy with stunning photographic backgrounds. Our tenets set forth our relationship to God and to our Savior, Jesus Christ. ChristianScience.com is the primary website for The Mother Church and includes a great deal of helpful information, background, explanations, history, frequently asked questions, videos, lectures, and links to other spiritual resources. A visit to ChristianScience.com can be inspiring, uplifting and eye-opening. Our Calendar lists all our services, meetings, special events, and talks on Christian Science. We are so happy to welcome your children in our Sunday School. There are also national fellowship organizations, summer camps, leadership programs, special discussion websites, podcasts, and Christian Science schools, available for young people. ​The Christian Science Society - Tampa Bay gratefully accepts donations, which are fully tax-deductible as allowed by law. We are a 501(c)(3) not-for-profit religious organization that relies solely on donations.